« Guest blogging at Cupcakes Take the Cake! 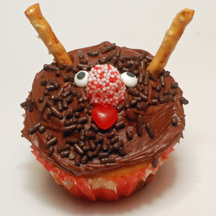 Chocolate sprinkles add texture to this reindeer cupcake. What You Need: 1 cupcake; chocolate frosting; chocolate sprinkles; 2 stick pretzels; red-and-white candy-covered gumdrop (or red gumdrop, or cherry sour ball); red hot for tongue (some brands are a little heart-shaped, which is cute); candy eyes or mini M&Ms. How to Make It: Frost cupcake. Add chocolate sprinkles. Place eyes, nose and mouth as shown. Stick pretzels near top for antlers. This entry was posted on Friday, December 19th, 2008 at 3:50 pm	and is filed under Christmas cupcakes. You can follow any responses to this entry through the RSS 2.0 feed. Responses are currently closed, but you can trackback from your own site.